Our Vegan Guide to Cambodia will help you find somewhere to eat delicious vegan food whilst exploring this wonderful country; it lists all of our favourite restaurants, links to other useful online vegan travel information about Cambodia and also a few restaurants we’ve not visited yet but other vegan travellers tell us that we should! 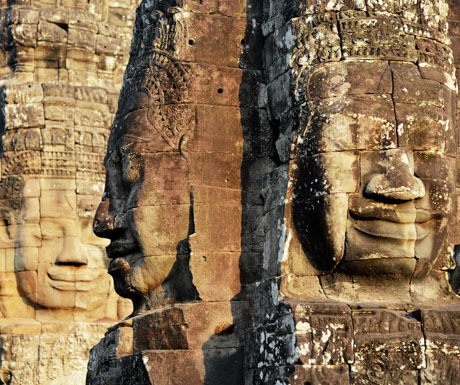 We love Cambodia, the Kingdom of Wonder, where you can immerse yourself in rich culture and history and soak up the vibrance of daily life at every turn. See lush green rice paddies and picture postcard rural landscapes, visit rainforests and waterfalls, tropical beaches, riverside towns, floating villages or fast growing urban cities; Cambodia has something for everyone. 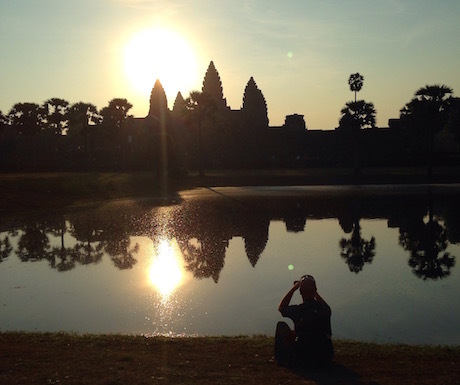 Siem Reap is so vegan friendly that we made it our home, known to some as ‘Temple Town’, it’s home to the magnificent Angkor Wat which should definitely be on everyone’s bucket list to see. As a vegan traveller you won’t go hungry here, with multiple choices including vegetarian restaurants with plenty of vegan options and omni restaurants that also serve plant based cuisine. 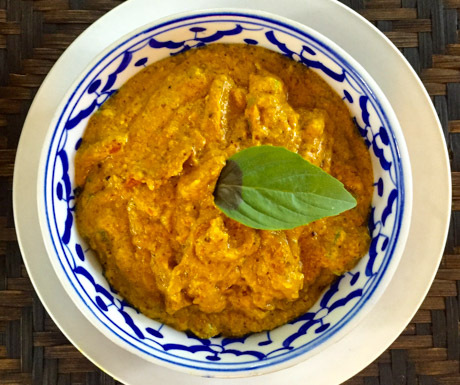 We’ve written a detailed and extensive Vegan Guide to Siem Reap that lists nearly 40 places where you can dine after an exhausting day exploring the temples but the following restaurants are some of our favourites. 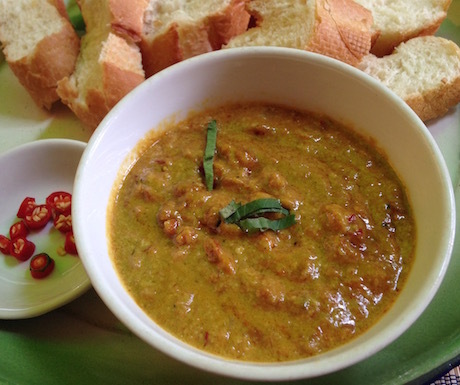 With 2 locations in town, Chamkar is a must visit for all vegan travellers passing through Siem Reap; plenty of traditional Khmer cuisine is on offer as well as some great salads but the dish that you should try is the interestingly named ‘Cambodian Wedding Day Dip’, a creamy peanut and coconut milk creation that is served with fresh chillies and slices of baguette – perfect for sharing a starter (or just order it and eat it all yourself as it’s delicious). The lovely owners at Chamkar were kind enough to share the recipe with us which you can find here meaning you can make it yourself at home too! 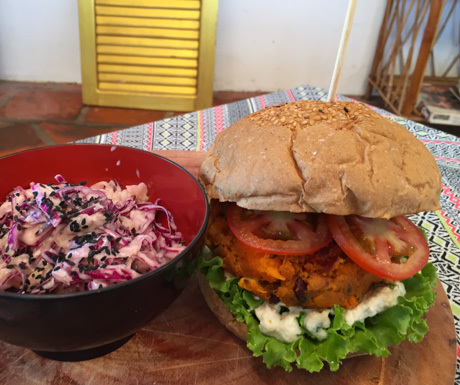 The chilled out vibes, good food and service to match at the Peace Cafe never fails to deliver. 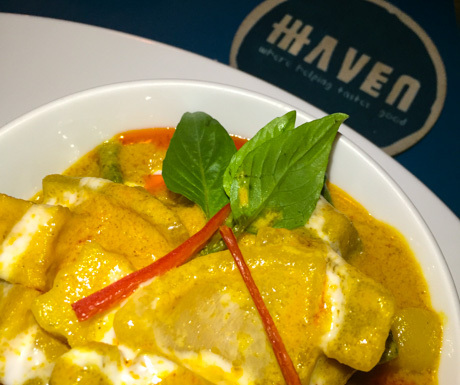 With part of their philosophy being to “nourish the body and soul of our customers” you can be sure that you’ll leave having enjoyed a tasty meal whilst enjoying supporting a social enterprise that has vegetarian cuisine at the core of its values. Check out the gift shop where they stock a whole range of responsibly sourced gifts that you can either buy for yourself or to take home to friends and family… So many dishes to choose from but please remember one of the ‘vegan rules of Siem Reap’ and that is that you must try the ‘Khmer Kreung Khtis’ at least once – you have been warned! Veg G Table has quickly made it onto our favourites list on account of their falafel plate; all home made, with light and crispy falafels, creamy hummus and amazing flat bread thta’s worth travelling to Siem Reap just to eat. There’s also a killer vegan beetroot burger to try too, and on our last visit we enjoyed a delicious bean and lentil chilli, laced with cocoa and served with an avocado mousse and poppy seed flatbread. It’s all veggie, but the menu is mainly vegan friendly and has been created with passion and the love for tasty, wholesome food plus the portions are really generous too. Only a few hours away from Siem Reap is Battambang, the second largest city in Cambodia behind Phnom Penh; despite the size it has a sleepy vibe and a thriving arts scene. Life revolves around the central market and tourists make a short visit to ride the bamboo train and see the surrounding countryside. Our Vegan Guide to Battambang tells you everything we learned from our last trip there, which included riding the bamboo train. 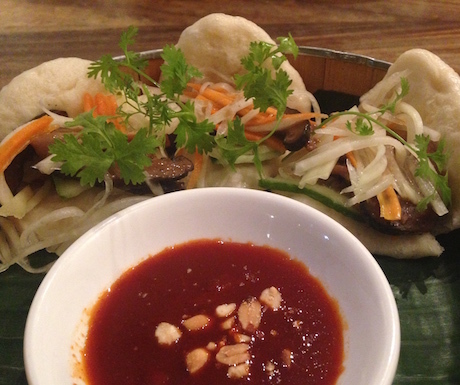 Without a doubt our favourite dining option was the wonderful Jaan Bai, a social enterprise restaurant that had legendary chef David Thompson create the menus – when you visit be sure to sample the delicious shiitake mushroom bao with slaw and peanuts; you can read our restaurant review of Jaan Bai here. 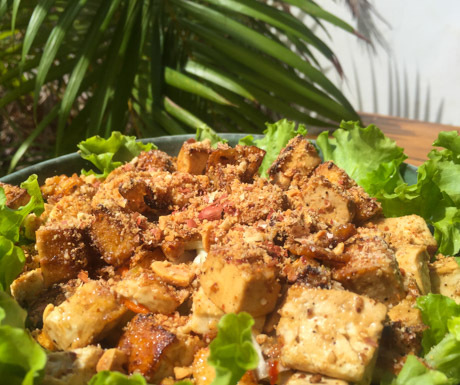 Ellies Cafe Kampot was one of our favourites in Kampot; decent coffee, a nice ambience, friendly staff and a very tasty vegan salad with sesame crusted tofu – what more could you want? Rikitikitavi is a great hotel in a perfect location on the riverside where you can enjoy happy hour whilst wathcing the sunset over the river. 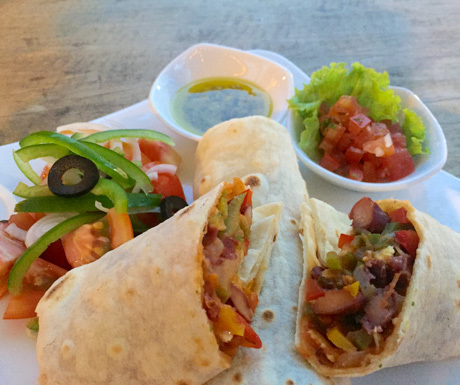 They also offer vegn breakfast for guests (upon request) and the main menu has a number of vegan options which were all very enjoyable, our favourite were the veg burritos which they happily ‘veganised’ for us. On the coast and often only a stopover to the nearby islands, there are multiple vegan options including Khmer food, falafels, hot dogs (yes, vegan hot dogs! ), pizza and quite simply the most amazing vegan pancake stack we’ve ever eaten, it was so good we went back the next day for more, for more details on where to find vegan food in Sihanoukville check out our Vegan Guide to Sihanoukville. 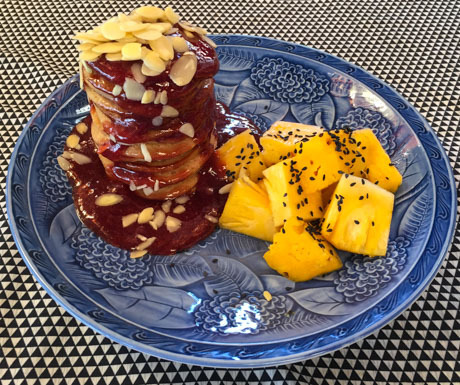 These pancakes can be found at the wonderful Dao of Life which is an all vegan restaurant owned by the lovely Shazia and looked after on a daily basis by her über friendly local team; if you find yourself in Sihanoukville you need to visit here as many times as you can, while your there check out the awesome vegan burger too. 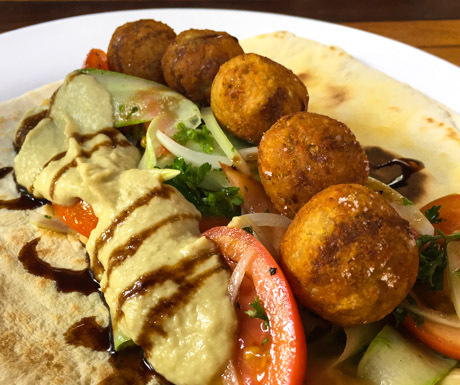 You can find great falafels and other Lebanese food at Hummus House, it’s not a fancy place but fancy isn’t required when good falafels are on the menu. Having recently opened to rave reviews in Siem Reap ARTillery Cafe is already a firm favourite on the Phnom Penh scene and well worth a visit, whilst not vegan (or vegetarian for that matter) they offer a variety of raw and vegan options including tasty pulled jackfruit tacos, a beetroot burger and their own homemade vegan mayo which is delicious! Renegade Travels have included ARTillery Cafe in their veggie guide to Phnom Penh which you can read here. We love Evergreen, a simple vegetarian restaurant (check with them which dishes contain eggs) that many fellow vegan travellers had told us about before we visited. 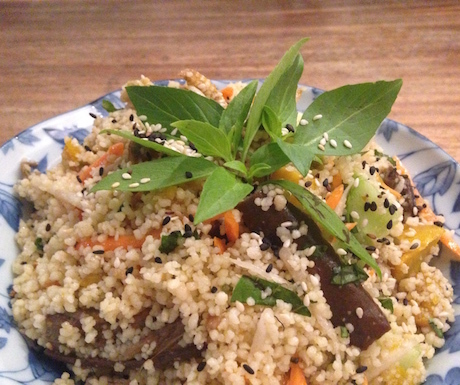 Expect local food veganised, some delicious noodle soups, homemade seitan and some really tasty dumplings. Order the addictively tasty ‘fried mushrooms’ if you want to try one of our favourites. Travel bloggers, Justine from Travel Lush and Ali from Bottled Air have both included Evergreen in their vegan & vegetarian Phnom Penh posts, along with other favourites of theirs. Central Market is a great place to shop and an awesome place to go and see the wonderful fruits of Cambodia alongside some really good traditional food. Find sugar topped rice flour donuts, akor cakes, jackfruit sticky rice and more amid the hustle and bustle of this cool local market. We hope our vegan guide to Cambodia has been helpful, for all things Cambodia check out the ever helpful Move To Cambodia website for a wealth of well researched and up to date info including this recent article ‘How to eat vegan and vegetarian in Cambodia’ which has some very useful language info cards and information about hidden ingredients to watch out for. On Facebook you can join the Vegan Cambodia group and also Veg in Phnom Penh where you will find more useful information for your Cambodian vegan travel adventure. If you are in Sihanoukville, then be sure to visit Bamboo Bar. The largest selection of vegetarian and vegan food in the city. Cooking on clean water without using sodium glutamate. Open 24 hours 7 days a week. The kitchen works from 8am to 10pm. We will be glad to see you! we will pop in next time we’re in town for sure! Oh my goodness thank you so much for this information, I can’t think what we would have done without it! 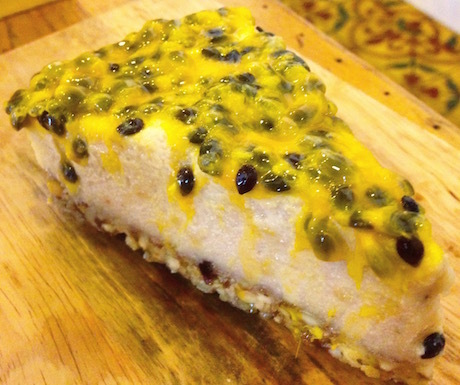 During our 5 day visit we tried the Peace cafe, Artillery and Chamkar – all delicious! Big thank you! I live in Siem Reap and i never heard some of your address. I’m happy to know this place now and i will try some.